the m4 east (stage 1b) environmental impact statement is currently on public exhibition from 9 september 2015 to 2 november 2015. view the m4 east information here at the dept of planning website. hard copies of the reports are available to be viewed at the leichhardt council customer service centre during opening hours. council is holding a public meeting on thursday, 29 november 2015 at leichhardt town hall, corner of marion and norton streets, leichhardt, from 7pm-8:30pm. hear presentations from leichhardt council and the westconnex delivery authority on the released stage 1b: m4 east environmental impact statement. the westconnex is a 33km motorway proposed to travel from Parramatta to Beverly Hills. it is proposed to connect parramatta, sydney airport and beverly hills. the section of the westconnex that passes through leichhardt is a tunnel from wawthorne canal to camperdown. the westconnex was first announced by the state government in 2012 as part of the infrastructure nsw report titled “first things first”. the total project is estimated to cost between $11-$11.5 billion with $200 million allocated to “seed funding” for urban revitilisation along the parramatta road corridor. the m4 widening (stage 1a) part of the project was determined and approved by the department of planning and environment in december 2014. view the m4 widening determination at the dept of planning website which includes the environmental impact statements and submissions. construction has now commenced on this stage. the m4 east (stage 1b) environmental impact statement is currently on public exhibition from 9 september 2015 to 2 november 2015. view the m4 east information here at the dept of planning website. the new m5 (stage 2) is currently under construction with the king georges road interchange upgrade. planning is underway for the motorway link from beverly hills to st peters. the m4-m5 link (stage 3) section is currently still being investigated. stage 3 will deliver a motorway tunnel with three lanes in each direction between the first two stages, linking the m4 and m5 corridors together. 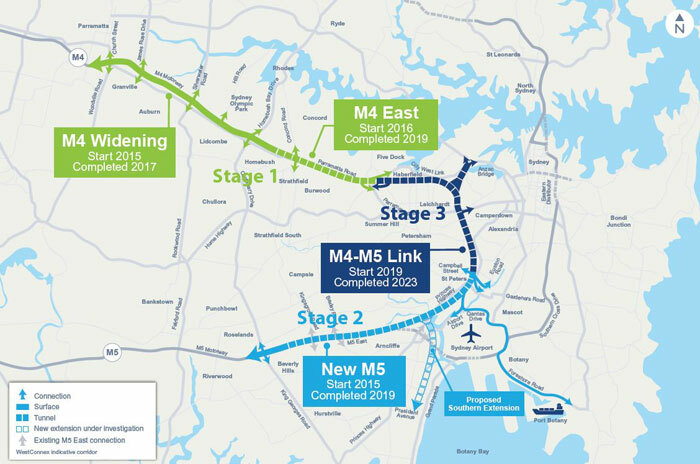 stage 3 is due to open to traffic in 2023.
the strategic review of the westconnex proposal prepared by sgs economics and planning is now available on the city of sydney westconnex page.